Asteri Utica - Welcome Home! RCIL is thrilled to announce that it will be providing on-site support services to the new residents of the apartments located at 327 Bleecker Street in Utica. What was once the Jeffrey Hardware building is now 46 brand new apartments with 12 set aside for individuals with intellectual or developmental disabilities. The building will have a fitness room, a meeting room, and laundry facilities in every apartment. Tenants will have the opportunity to participate in a Resident Council and have input into the operations of the building. Opening day is scheduled for March. Fully accessible apartments are available! Applications are available now. Please contact Mary Brognano for more information: 315-797-4642 ext. 2976 or email MBrognano@RCIL.com . Join the Heart Run and Walk! 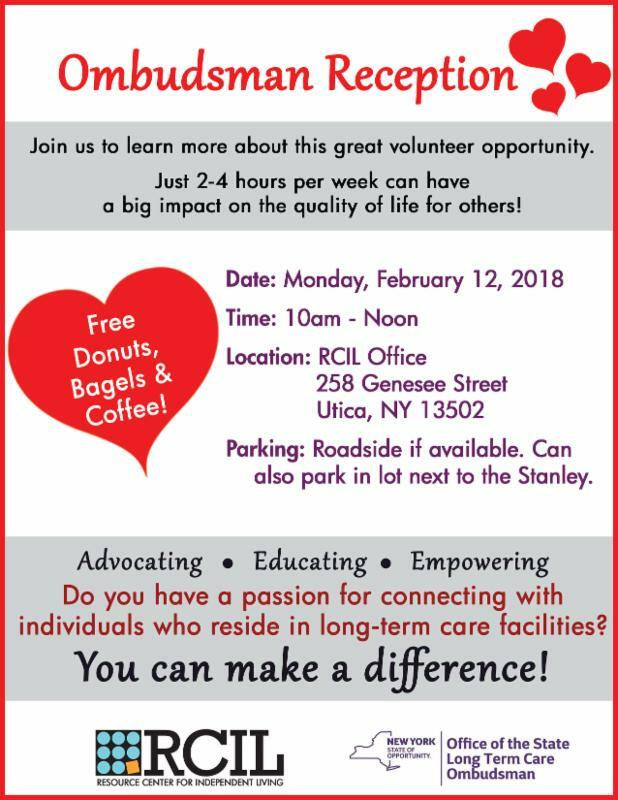 The Wellness Committee invites you to join the RCIL Team for the Heart Walk on March 3 rd in Utica. 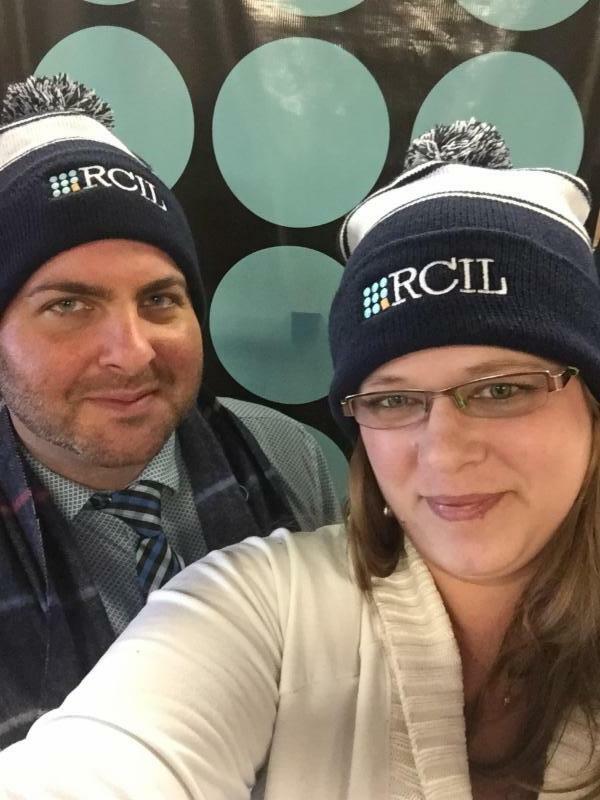 The RCIL team will participate in the 3-mile walk sporting these cool new hats modeled by Michael Yanney , RCIL Events Coordinator, and Georgie Sanges , RCIL Marketing Associate. RCIL staff and family members are welcome to sign up and walk with Team RCIL. The power we have together far outweighs what we can do alone. Please consider joining the team or making a donation to help our team reach our fundraising goal for the American Heart Association. A minimum donation of $30 is required for walkers over 16 years old to participate in the Heart Run and Walk. Sign up here and join the team! Jacqueline Ford with one of her blankets destined for St. Jude's Children's Hospital. Jacqueline Ford, a participant with the Adult Day Services program at RCIL, has been crocheting since she was 16. 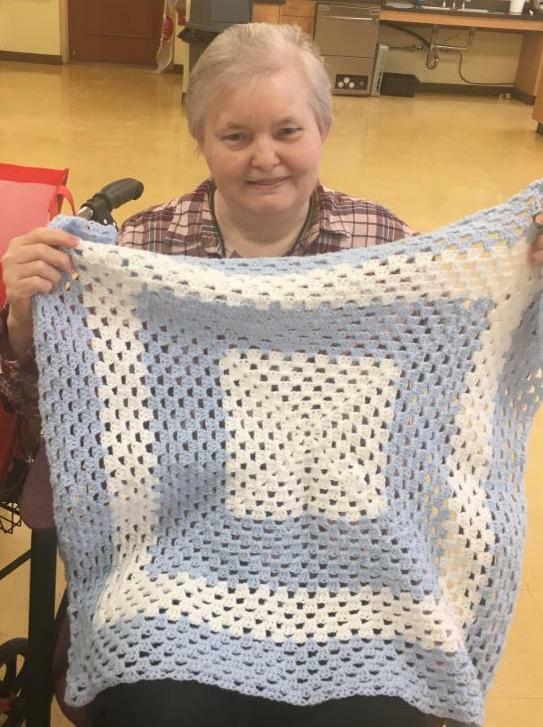 Attending the program allows her to enjoy visiting her friends, listening to music, and crocheting. Recently, she decided to share her talents with children fighting cancer. Jackie is currently working on her 6th blanket and plans to donate them to the St. Jude’s Children’s Research Hospital. When asked why she chose to do this, Jackie explained, “I feel something special in my heart for the babies and children [with cancer]." The Adult Day Services program includes in dividualized care planning, door-to-door transportation, nutritious snacks and lunch, personal care, a variety of activities, access to salon services, social interaction, field trips, and connection to the broad range of services available through community resources. Participation in the RCIL ADS program supports the self-determination and independence of elderly residents in our area as it helps individuals age in place and avoid institutionalization. ﻿The year-long Supervisor Bootcamp started in January. A mix of 27 RCIL seasoned supervisors, new supervisors, and emerging leaders will meet once each month to participate in discussions and activities focusing on critical skill areas including Communication, Relationship Building, Time Management, and Conflict Resolution. Guest presenters and subject matter experts join Diane Guckemus , RCIL Director of Training, to explore a wide variety of leadership topics. Questions about the program can be emailed to Diane Guckemus or call 315-797-4642 ext. 1655. 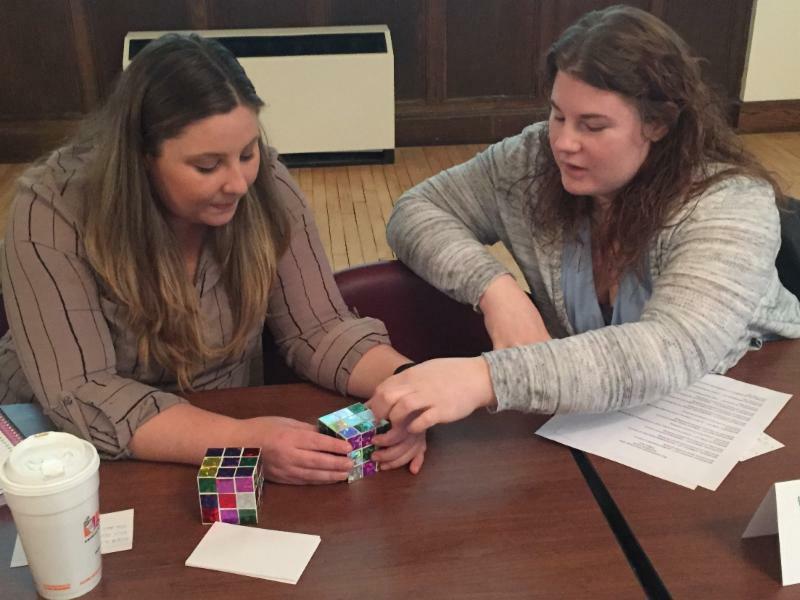 Jennifer Murphy , Self Direction Broker in Utica, and Krista Murphy , CDPAP Coordinator in Herkimer, discuss their approach to solving the Magic Cube. 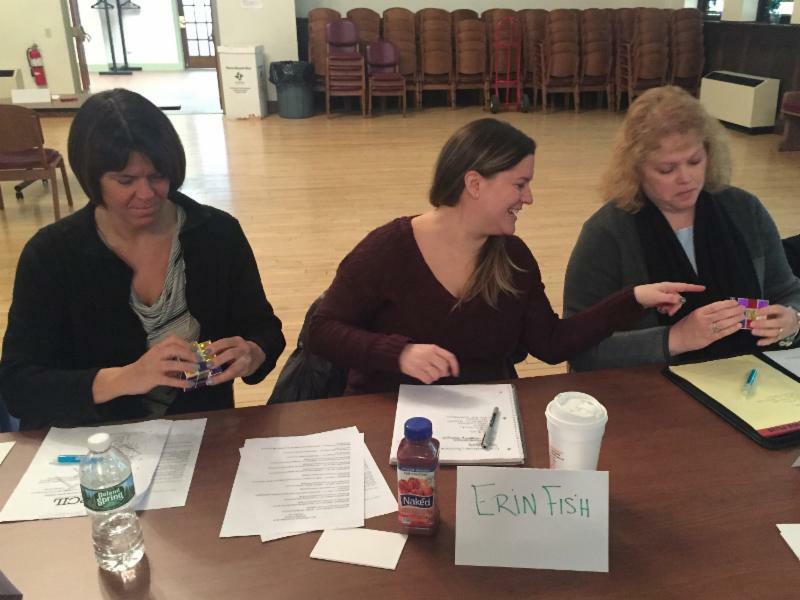 Andrea Espinosa , Reimbursement Specialist Supervisor, Erin Fish , Office Manager for AHIC, and Rachael Johnson , CDPAP Coordinator, share a laugh. 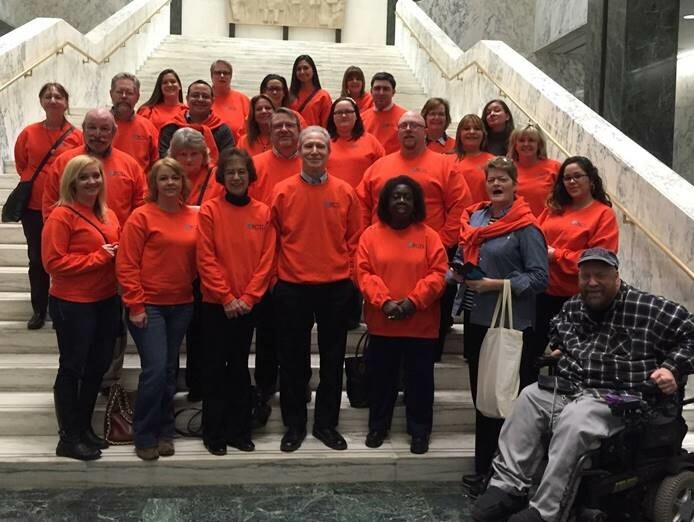 Each year, RCIL staff members get on a bus and ride to Albany to spend the day meeting with our local legislators. They talk about issues concerning individuals with disabilities and answer questions the legislators may have. This is a great opportunity for staff to gain knowledge about issues currently before the legislature and to participate in systemic advocacy, a core service of every independent living center. A training session for participants is held prior to the trip to provide education about hot topics. All RCIL staff are welcome to join the effort and make the trip. The bus starts early in the morning at the Columbia Street office in Utica and makes stops at the Herkimer and Amsterdam Thruway exits to pick up staff from those offices. After the meetings in Albany, the bus makes the return trip and drops everyone off. It is a long day, but well worth the effort to get some hands-on experience in systemic advocacy. See the NYAIL 2018 Disability Priority Agenda here. For more information contact Gene Hughes or call 315-797-4642 ext. 2933. Congratulations to the graduates of the Utica Tax Preparation class for volunteers in the Volunteer Income Tax Assistance program. Other classes were held in Rome and at Hamilton College. These volunteers will provide free tax preparation assistance to individuals who meet the required income guidelines. Their commitment to the community and dedication to this program is much appreciated by the participants. For information about the Free Tax Program and the Mohawk Valley Asset Building Coalition, contact MVABC or call 315-272-1888. RCIL - a Great Place to Work! Whether you are just starting your career or looking to take your career to the next level, RCIL may have a place for you. If you are not already working for RCIL, why not take a look at the postings on the RCIL website? 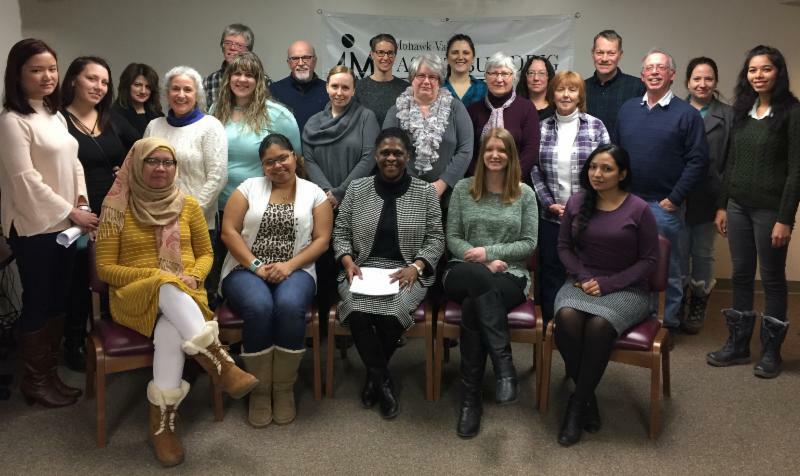 Due to tremendous growth in the organization, there are many positions available at our six locations: Amsterdam, Herkimer, Watertown, and three sites in Utica in addition to offsite positions working in the homes of participants. We are looking for hard-working people who have a commitment to helping individuals with disabilities to live independently. Consider joining our team and apply today! *Exact benefits and eligibility will vary depending on the category of the position, number of hours worked, and employee selections at time of hire. Go to the RCIL website to review the open positions and apply online! For more information, email Nate Discavage, RCIL Recruiter, or call 315-797-4642 ext. 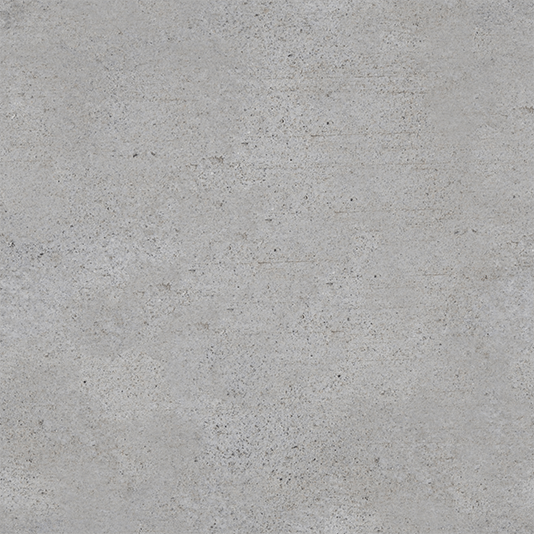 2992. Find Out what it takes to become a Volunteer Ombudsman! You can make a difference! RCIL and the NYS Long Term Care Ombudsman program are hosting a Reception on Monday, February 12 th from 10am – noon at 258 Genesee Street in Utica . The Ombudsman Program provides advocates and resources for those who reside in long-term care facilities such as nursing homes, assisted living, and adult care facilities to investigate and resolve complaints on behalf of the residents. RCIL and the NYS Long-Term Care Ombudsman program are looking for Volunteers to provide this much needed presence in local nursing homes throughout Herkimer, Madison, Oneida, and Otsego Counties. Join us to learn more about this great volunteer opportunity! Just a little bit of your time (about 2-4 hours per week) can have a big impact on the quality of life for others! For more information please call 315-797-4642 ext 1872. You take care of others, let us take care of you! JOHNSTOWN Are you the primary caregiver for someone with Alzheimer’s Disease or Dementia? 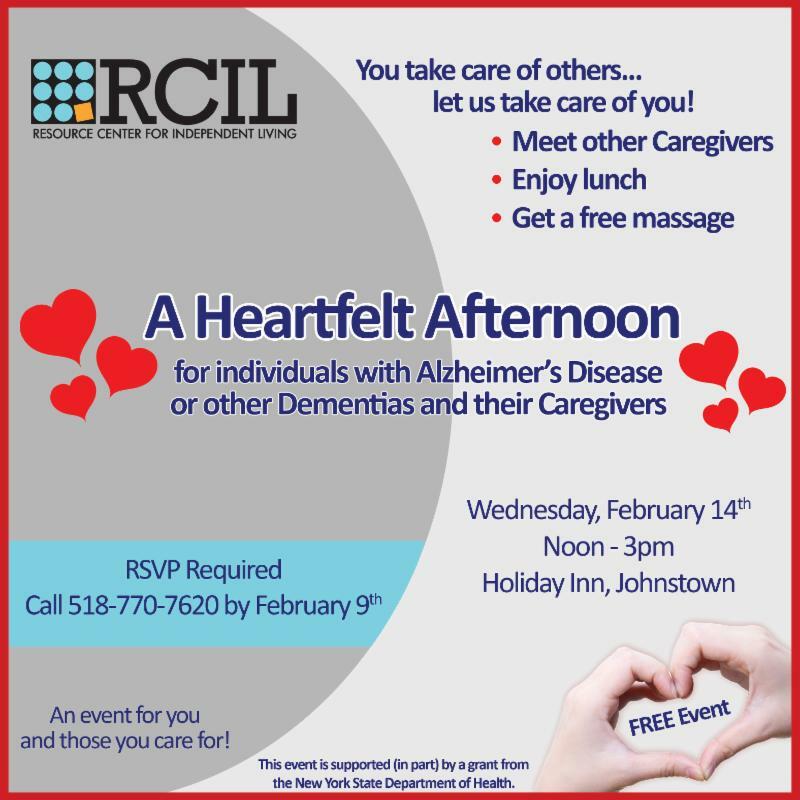 If so, RCIL invites you and the one you care for to “A Heartfelt Afternoon" for Individuals with Alzheimer’s Disease or other Dementias and their Caregivers on Wednesday, February 14 th from Noon - 3pm at the Holiday Inn located in Johnstown. This is a free event for you and those you care for. Join us to find out what resources are available, learn about upcoming events for you and those you care for, have a chance to meet other caregivers, enjoy lunch, and get a free chair massage! Registration for this event is required. Please call 518-770-7620 to RSVP by Friday, February 8, 2018. This event is supported (in part) by a grant from the New York State Department of Health. UTICA Are you the primary caregiver for an elderly individual? 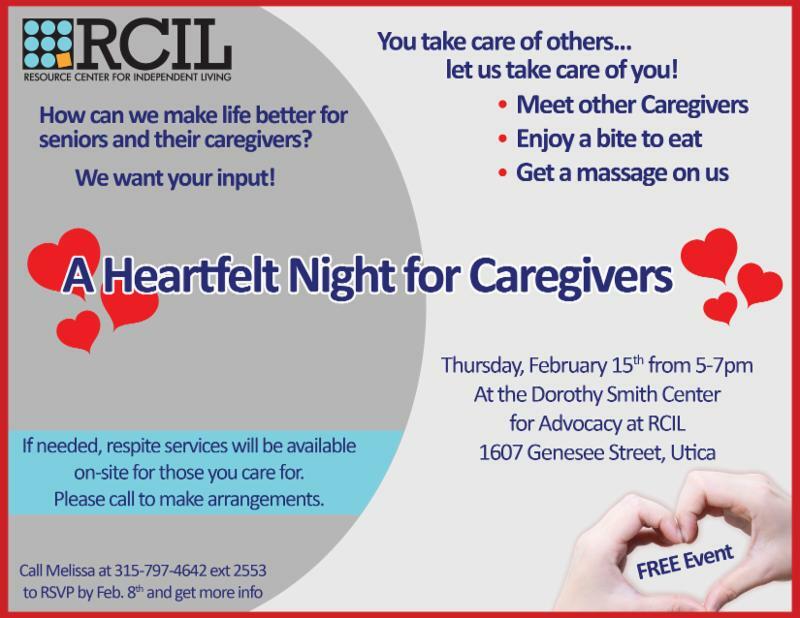 If so, RCIL invites you to “A Heartfelt Night for Caregivers” on Thursday, February 15 th from 5-7pm at the Dorothy Smith Center for Advocacy at RCIL ( 1607 Genesee Street in Utica ). This is a free event. Come meet other caregivers, enjoy a bite to eat, and get a free chair massage! RCIL is working to improve the lives of the senior population within our community. While you’re here with us, we would like to get your input on how RCIL can make life better for seniors and their caregivers! If needed, respite services will be available on-site for those you care for. Call Melissa at 315-797-4642 ext. 2553 for more information and RSVP by February 8 th . Get ready for another fun-filled evening of great food and friendship. 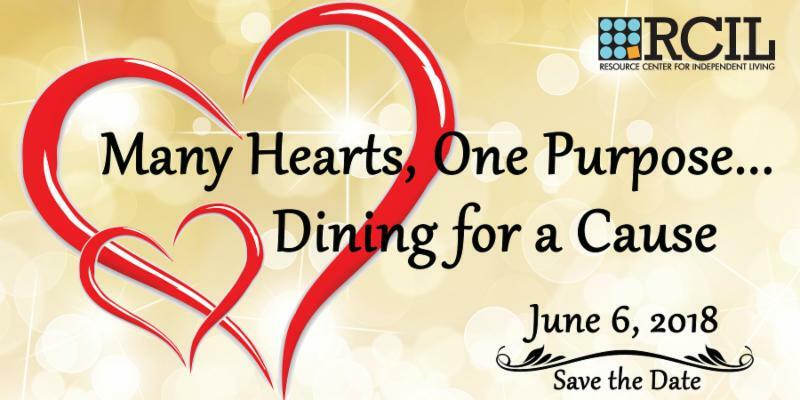 The Second Annual Many Hearts, One Purpose Dining for a Cause event will be held on June 6, 2018. Please put this on your calendar now!